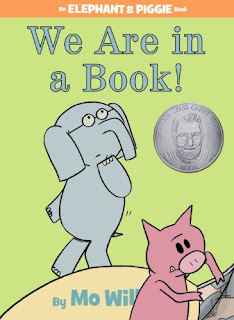 This past month we've been spending a lot of time with Elephant and Piggie by the infamous Mo Willems. I had avoided them up until recently because I understood them to be little pieces of comedy and I wasn't sure that Bookworm1 (age 4) was quite in a position to enjoy them. (I'm still holding off on good old Amelia Bedelia so that they might be properly appreciated.) Some books you save in order to savor more completely. Elephant and Piggie were two such characters. On a whim though I found them on a recent library trip. (Yes. A library trip. Even though I have confessed in the hidden comment section that I don't actually enjoy going to or making use of the library. Gasp!) I figured I could test them on Bookworm1 by bringing home copies from the library. I also figured it was a very good sign that he had reached The Age of Appreciation when he sat in the corner of the room with a book and started laughing hysterically just by looking at the pictures. Hmm. So I picked up the copy of We Are in a Book! and read it outloud to him. He doubled over laughing. Hysterically, as I already said. So funny. I started giggling at him giggling over the book. Since that first impression I think we've managed to read all of the Elephant and Piggie books, minus one (which we haven't located yet.) Our favorites are We Are in a Book! , I Will Surprise My Friend! and Watch Me Throw the Ball! . 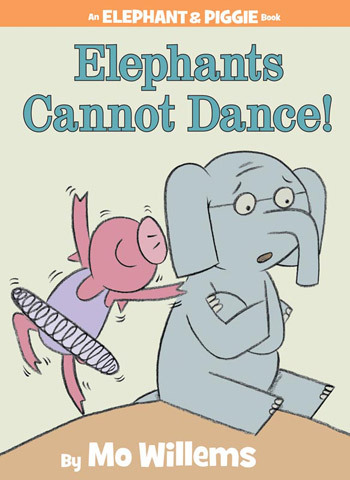 Elephant and Piggie are good friends who like to do everything together. Their stories revolve around simple things that children can easily identify with such as: sharing ice cream, playing with a new toy, reading a book, dressing up, and just generally being silly. Having sat and read Elephant and Piggie for upwards of thirty minutes at a time, I can tell you that they do begin to wear on the adult reader after a bit. I recommend spacing them more than we did. A book here, a book there sort of thing. They'll retain their humor better that way. You'll delight in watching the little ones roll around on the couch next to you, out of air because they're laughing so hard they aren't even making sounds anymore. (You really can't beat that kind of reading experience.) Willems is a comedic genius when it comes to pre-school aged children and that's really all I can say. That, and that I do hope to be adding these books to our home library over time. Hehe! Yes, even just the pictures bring laughter to 4 and 2 year olds! We love them. Like you, we hope to add some to our library. I think we need to give Elephant and Piggie another chance at the House of Hope. My girls have never loved them, but then, they're hard sells when it comes to early/easy readers. :D :D Great big grin here, b/c my 3 and 5 year olds love them too!! I have limited them to checking out only four at a time from the library, and within seconds of our walking into the library door, they are sprawled on their stomachs with one of these books in front of them. 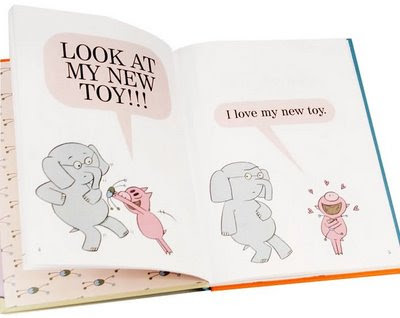 We absolutely love Elephant and Piggie books at our house! In fact, I often secretly hope that my 5-year-old will pick one for his bedtime book, because I so enjoy reading them. :) One reason I think my 5yr-old likes them so much is that he could read them himself when he first began reading. Our (my!) favorite is We Are in a Book. We'll have to try these. I have one child who adores silly. We like the Mo Willems Pigeon books but haven't tried the Elephant ones yet.